How will you find the best location for your new Chiropractic practice? The best any of us can do is to get the facts, plan the work, and work the plan. Locus has the facts! Our demographic data is focused on enabling you to “plan your work” by revealing high potential sites as a first step in identifying a truly successful Chiropractic practice location. The ACA, Business Information Systems (BIT) and Locus have identified ten factors which help you to make an effective and informed decision on where to locate your potential new practice. Our data is gathered from U. S. Census resources such including the American Community Survey (ACS) for population and demographics, and the County Business Patterns (BP) and Statistics of U.S. Businesses (SUSB) for business information. This data, when combined with geographical data in a friendly and task-focused format, provides a powerful too to help you find the best location for your chiropractic practice. Our sweeping new enhancements are here! The best Chiropractic demographics resource is now even better! You could be examining detailed information for your desired Chiropractic practice location in minutes! As of September 2018, our chiropractic data has been updated with the latest available! Locus Chiropractic Demographics is dedicated to serve the Chiropractic profession by finding new practice locations for both recent and established graduates. 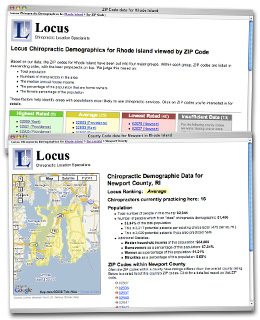 Locus uses ten essential Chiropractic demographic factors based on accurate state, county and zip code data to find potentially successful practice sites.